Banana Pants were originally from an exotic archipelago known as The Mofongo Keys. They were recruited by Radley Madish and brought to the mainland to help invade Neapolitown. The Banana Pants were promised trousers made of the finest silk in exchange for their help. However, in an attempted to cut costs, Radley substituted silk for burlap. 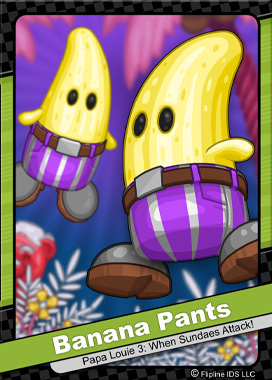 The Banana Pants were stuck with intensely itchy trousers, causing them to jump and skip around without any regard for their surroundings. ← Peggy’s Fan Art Round Up!